Sergio Reguilon is a 22-year-old footballer who plays in the left-back position for Real Madrid. He has graduated from the Real Madrid academy. He was recently promoted from the Castilla side. He has been a breakout star for the Los Blancos this season. He has also managed to bench club legend Marcelo with his eye-catching performances. In the previous consecutive matches between Barcelona and Real Madrid, Reguilon was one of the best players for Real Madrid. He is extremely passionate and is viewed as a future captain by many at the Bernabeu. After losing by three goals at home against Barcelona despite playing so well, the young Spaniard got teary eyed. 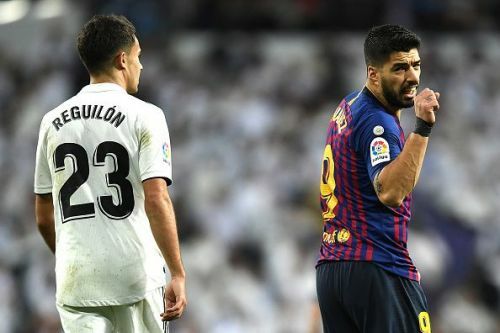 In the recent La Liga El Clasico, Barcelona's striker Luis Suarez made an embarrassing and disgraceful gesture towards Madrid's Sergio Reguilon, mocking him about his crying in the previous Clasico in which Barcelona won. Luis Suarez is definitely one of the best strikers of this generation but he is not someone for the young players to look up to. By making such a gesture, Suarez made fun of the passion of a young footballer, and it is not something to be proud of for the Uruguayan. Real Madrid will play Ajax mid-week and try to win another Champions League trophy. They'll be more motivated than before having lost the Copa Del Rey and being virtually out of the Last Liga race. Sergio Reguilon will probably keep in benching Marcelo for the rest of the season because of his incredible form.